Because of its unique closed cell structure, Dicaperl’s masonry fill insulation can drastically reduce heat transmission through masonry walls. The efficiency of perlite loose fill insulation has led to its almost exclusive use in insulation tanks containing liquified gassed where temperatures of -320°F and below must be maintained. Thermal performance tests show significant energy savings when perlite is used to fill cavities in concrete masonry structures. These tests have determined that perlite masonry fill insulation can be more effective than polystyrene beads, polyurethane foam, polystyrene inserts, vermiculite core fill insulation, and foamed-in-place insulation. In addition to its closed cell structure, a key to perlite’s performance is its ability to seek out and completely fill all crevices, voids, and mortar areas in a masonry wall without bridging. This flowability characteristic of perlite masonry insulation assures a completely and efficiently insulated wall. In addition, this flowability feature enables the masonry contractor to install several courses of block before pouring insulation into cavities and/or core holes. Because perlite masonry fill insulation is non-settling and will not compact under its own weight, it is a permanent insulation that will last the life of the structure. As Dicaperl’s perlite masonry fill insulation is field installed following the layering of several courses of block, it does not interfere with masonry contractor nor is it subject to damage in handling. Free-flowing perlite masonry fill insulation is merely poured into cores, ear holes or cavities by means of a simple hopper. No special equipment or skills are required to properly insulate a masonry wall with Dicaperl’s masonry fill perlite insulation. Perlite is a Class A, Class 1 building material with a temperature range for fusion of 2,300 to 2,450 degrees Fahrenheit. Underwriters Laboratories show that a fire rating of a 2-hour rated 8, 10, or 12-inch concrete block wall is improved to 4-hours when cores are filled with masonry fill Tests show that a two-hour rated 8”, 10”, or 12” concrete block wall is improved to four hours when cores are filled with perlite masonry fill insulation. In addition, Dicaperl’s perlite insulation does not generate fumes when heated. These features of masonry fill insulation make the product particularly suitable for insulating stairwells and elevator shafts. 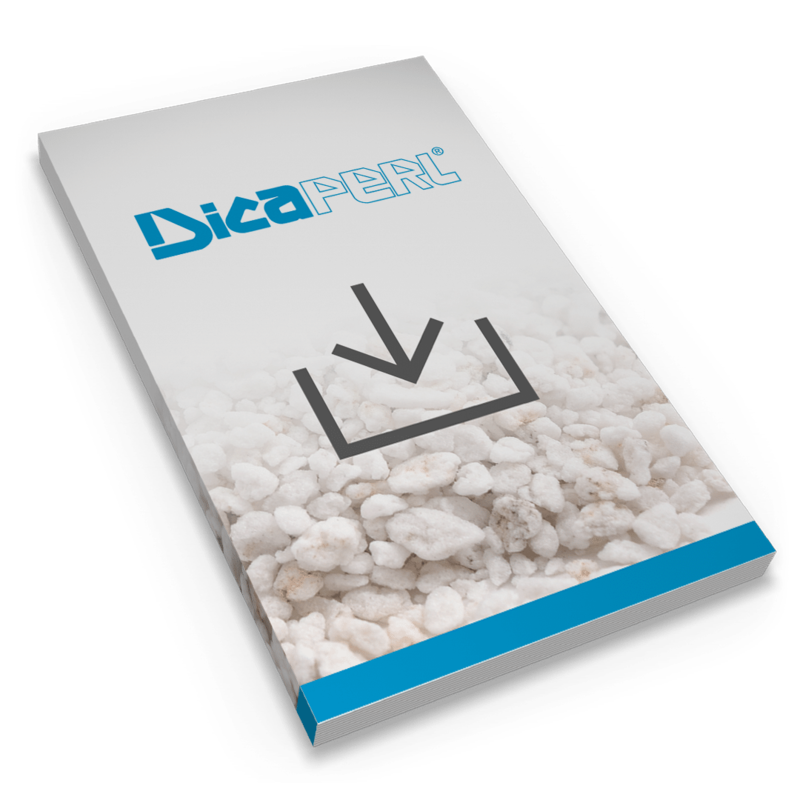 Dicaperl’s perlite masonry fill insulation is permanent and will not rot or otherwise decompose. In addition, it is termite, rodent, and vermin resistant and will not support fungus growth. Because Dicaperl’s perlite masonry fill insulation is a permanent and efficient insulation, it will provide energy saving dividends year-after-year for the life of the structure. Energy savings alone will quickly pay back the cost of the insulation and will decrease building heating and cooling costs for years to come. In addition to being lower-cost than other fillers, perlite is lightweight and pours easily without the need for special equipment or training. Download our Perlite Loose-Fill Masonry Insulation Guide. Refurbishing an in-ground pool with a new, insulating, perlite-concrete pool bottom. Perlite insulating concrete pool base can substantially reduce heat loss to the ground thus keeping pool water warmer for a longer swimming season. This will reduce energy costs when pool water is heated. In addition, perlite pool base provides a firm, smooth, foundation that prolongs the life of vinyl liners. 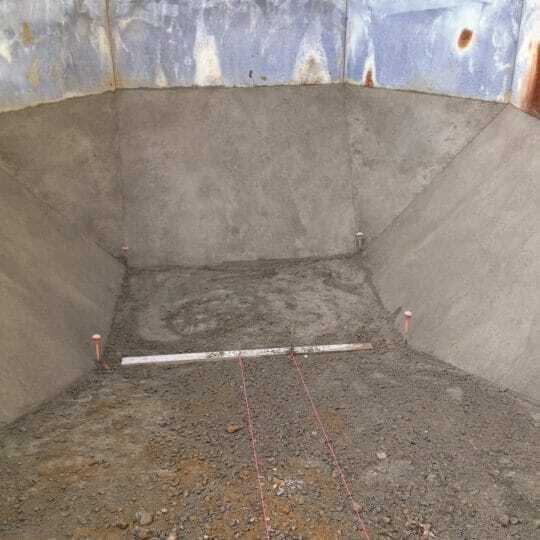 Download our Perlite Insulating Concrete Pool Base guide for mixing procedures and typical mix formulations for perlite aggregate insulating concrete. And to learn more about Vermiculite as a Concrete Pool Base Aggregate (CPBA), download our Professional Installers’ Guide.